Get licensed is a platform for users seeking career as a security professional or security training provider. It was founded on the idea of providing training using a career-oriented portal, which could help students find the most suitable training courses for their needs, enroll in the courses, book the tests online, and apply for a license. Get Licensed assist trainees in getting a job in security by helping them get a license, as without a license, users cannot work in this industry. 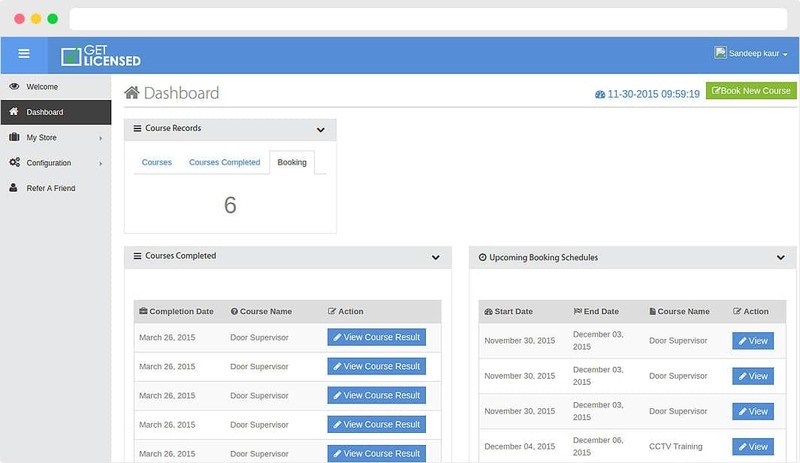 It also enables training providers to reach a wider audience and manage bookings. The courses that Get Licensed offers include Door Supervisor, CCTV Operator, Personal License, First Aid, Security Guard, and Close Protection. Debut partnered with Get Licensed to help put their solution in order. Debut Team came up with a product strategy and unified platform that would provide an ecosystem for course registration, e-learning, test booking, applying for a license, and job search – all in one place. We created an integrated solution using the modern, cutting-edge technology. The whole solution was designed around the concept of developing an ecosystem where a user could do it all in one place – register for a course, access e-learning and on-demand learning, ask questions to an instructor, book the tests online, apply for a license, and search and apply for a job. Also, our platform is designed keeping mobile devices in mind, and the website automatically adapts to any mobile platform, providing a greater learning experience. On the technology front, we leveraged modern PHP MVC framework for developing the application engine, and utilized ultra-efficient MySQL database for data storage. We also utilized Solr for lightning speed search and NodeJS. The completely revamped web site now provides a simplified access to course registration, finding courses, e-learning, applying for license, viewing test history, and applying for a job – all in one place. Get Licensed is now UK’s No. 1 Course Finder for SIA Security Training and Personnel License training. Over 130,000 customers have already booked their training via Get-Licensed.co.uk and achieved over 200,000 nationally recognized certifications. Get Licensed also has the largest selection of training providers with over 70 venues across the UK., offering a largest selection of available training dates.